That Old Devil Called Love and It Don’t Mean a Thing…jazz standards have been getting people of all ages up on the dance floor for the last 100 years or so. If you want to hire a jazz quartet to play the standards in Sussex or London then you’ve come to the right place. Our bands have livened up thousands of events between them and they come with the talent and professionalism that means you won’t be disappointed. 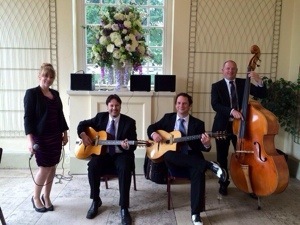 Whether you are planning a wedding, a party, a corporate event in Sussex and London, or you run a hotel that’s crying out for a splash of sophistication, a standards jazz quartet could be just the thing for you. Sara Oschlag Quartet – Sara is one of our most popular singers. With her quartet she performs a large repertoire of jazz standards and bossa novas. She’s in high demand for weddings, corporate events and parties. 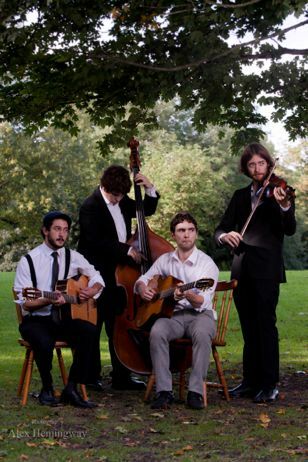 Jonny Hepbir Quartet – Jonny’s gypsy jazz quartet is a very popular band. It comprises of female vocals, two guitars and a double bass. Think Paris in the 1930s: the continental sound gets toes tapping. The Chris Coull Group – Trumpet player Chris Coull is a fine musician. His bands have been a feature of the Qatar music scene for the last 15 years. Now he has moved back to the UK, and is already making waves. Ultraswing – This is one of the UK’s longest-running gypsy swing groups. Featuring some of the country’s finest talents, they perform Django’s music and many jazz standards with effortless aplomb. 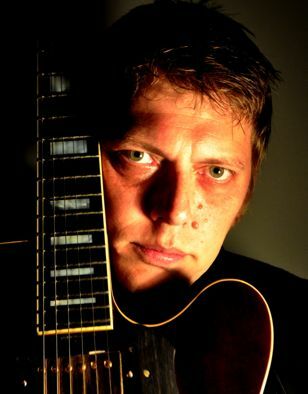 Nigel Price – London-based guitarist Nigel is one of the best in the UK. He regularly plays the late set at Ronnie Scott’s. He’s available with his quartet to play events, weddings, parties or anything else. Want to see more of our quartets? If you’d like to see some more of our quartets, visit our Choose a Live Jazz Band page where you can see all of our acts. At The Jazz Agency we like to let the music do the talking, so here’s what we’re so excited about: some of the best jazz talent in the country, available for your event at a price you can afford. A quartet is a good size to add a sophisticated ambience to that corporate event or birthday party without being too loud or distracting. Playing an array of popular standards, you can be sure having a live jazz band will lift your event. If you want your evening to be memorable then hire one of our jazz quartets. It’s as simple as clicking on a link. Check out the space you want the band to play, settle on your budget and take a browse of our talented group of jazz musicians to see which one takes your fancy. Our job at The Jazz Agency is to provide a link straight to the band so you can arrange your own personal gig to suit your needs. Once you’ve chosen your band, contact us with any questions.